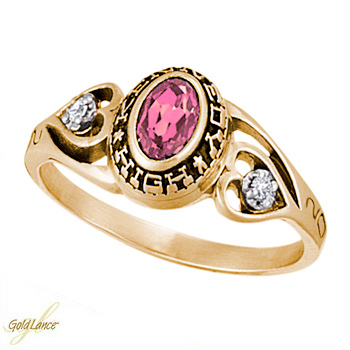 Hearts accent the ladies' Heartbeats class ring crafted in AmberXT with diamond or cubic zirconia side stones. Ring is made in the USA by Gold Lance. Graduation year is also engraved on the sides. When you have finished, please click the 'ADD TO SHOPPING BAG' button on the bottom of the page to add the personalized item to your shopping bag. The first two digits of the graduation year will be engraved on the left side of the ring and the last two on the right side. No emojis or symbols can be engraved. please click the button below to add your personalized item to the shopping bag.